Illinois laws regulate and detail how drivers are supposed to act in traffic. 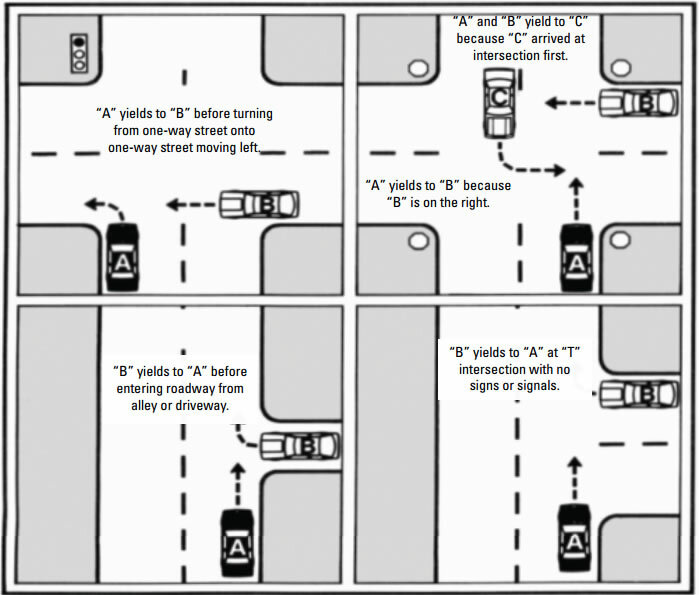 These are so-called “Rules of the Road“, and “Right of Way” is a very important rules to understand and apply while driving. When making a right turn on a red light after a complete stop. After coming to a complete stop at an intersection where there is a stop sign or flashing red signal. If there is no stop line, stop before the crosswalk. If there is no crosswalk or stop line, stop at a place where all approaching traffic can be seen. When making a left turn on a red light after a stop from a one-way street to another oneway street with traffic moving to the left. When more than one driver reaches a four-way stop intersection. The first driver to stop should be the first to go. When two vehicles on different roadways arrive at a four-way stop intersection at the same time, the vehicle on the left should yield to the vehicle on the right. When entering an intersection with a flashing yellow arrow. When two vehicles on different roadways reach an uncontrolled intersection at the same time. The vehicle on the left should yield to the vehicle on the right. When making a left-hand turn into oncoming traffic. If drivers enter an intersection while the light is green, they may finish the turn even though the light turns red. When approaching a MERGE sign with through traffic. A driver must increase or decrease speed to avoid a crash. When approaching a YIELD sign. A driver should slow down or stop to avoid a crash. Even after the light turns green when there are vehicles in the intersection. When emerging from an alley, building, private road or driveway after coming to a complete stop. To cross traffic when on the terminating highway of a “T” intersection with no traffic control signs or signals. When approaching emergency vehicles using audible and visual signals. Enter an intersection or drive within a marked crosswalk unless there is enough space to allow passage of other vehicles and/or pedestrians. Drive onto a railroad crossing. When a pedestrian is in a marked crosswalk. On school days, when children are in close proximity to a school zone crosswalk. When a pedestrian is in an unmarked crosswalk on the driver’s side of the roadway and there are no traffic control signals. When making a turn at any intersection. When making a lawful turn on a red light after coming to a complete stop. After coming to a complete stop at a stop sign or flashing red signal at an intersection. When a pedestrian enters a crosswalk before the traffic light changes. When a pedestrian is walking with a green light, to a walking person symbol or a walk signal. When a pedestrian is leaving or entering a street or highway from an alley, building, private road or driveway. When a pedestrian is entering an intersection with a flashing yellow arrow. A driver also must yield to workers in highway construction or maintenance areas as well as to persons with disabilities, including those with physical, hearing and visual disabilities. Find out more about Illinois driving laws and rules in our “Rules of the Road” archive! 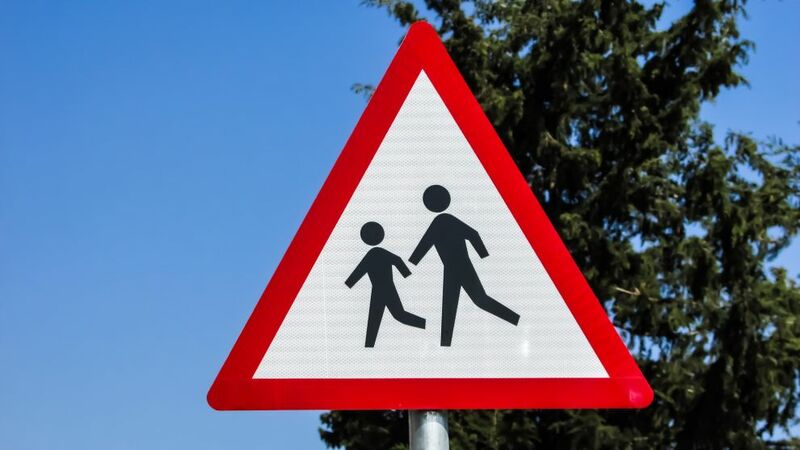 This article about Illinois Right of Way Laws was last updated in 2019. If any of our information is incomplete or outdated please let us know. Thank you!